Man I laugh so much at this show and absolutely love it! Featuring a swag of stars and Ashton Kutcher in a role that he was born to play, this show is about the trials and tribulations of a group of friends growing up in the 1970’s. Whilst most of the show is a no brainer in terms of working out plotlines etc, the staple ingredient of this show is the relationship between the Forman family is what holds it all together, albeit in a very odd way with their dysfunctional parents, Kitty & Red, the main character Eric and his sister Laurie. I love the interaction between all the characters in this very human and likeable show. Part of the problem that I thought might have got in the way of things is the fact that the show is set in the 70’s as you would appreciate and I thought that the topics covered would alienate some viewers. Basically this was not the case and unless you despised the clothing of that time, this would have been the only part of the show that really would put anyone off. 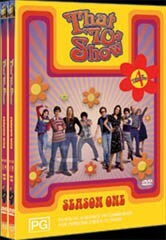 If you want a good laugh, I can highly recommend this boxed set as a solid piece of entertainment. It’s a lot of fun and certainly great viewing for the entire family. Fortunately nowadays there is not that much that comes across badly when it comes to audio and video and I really can’t see anything that is really worth the time to complain. Extras are a bit sparse but enjoyable all the same, just a not enough meat on the bones for me. Here is a listing of the episodes in this series. Go get some!